Dr. Mehta is Board Certified in Physical Medicine and Rehabilitation. He attended medical school in Kansas City, MO and completed his internship and residency in Chicago. During his residency he published multiple research presentations and worked closely with orthopedic surgery and pain management. During his training he was named chief resident and received the Department of Orthopedic Surgery Research award. 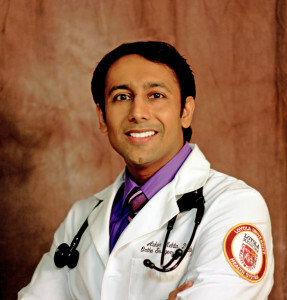 In 2010 Dr. Mehta received the prestigious American Pain Society’s Fellows scholarship. He received certification from Harvard Medical School in structural acupuncture. He is part of the Texas Pain Society, Texas Medical Association and The Harris County Medical Society. Dr. Mehta has presented his research at 5 national conferences over the last several years. He has completed three Triathlons, a half marathon and enjoys the outdoors. His practice philosophy pivots around improving daily function and the idea that the body intrinsically wants to heal itself and the physician’s role is to help it achieve this homeostasis. Dr. Mehta utilizes the most cutting edge treatments such as platelet rich plasma, spinal cord stimulation, radiofrequency nerve ablation, vertebral augmentation and combines it with a holistic approach. Dr. Mehta has patients who are pro-golfers and even veterans from WWII. He is proud to become part of the Houston medical community and is happy to treat and help restore function using a full spectrum of medical treatments available. He provides a comprehensive treatment plan that includes physical therapy, occupational therapy, aqua therapy, as well as post- surgical therapy. He has an outcomes based comprehensive treatment approach. As a Physical Medicine and Rehabilitation doctor his focus is on function and return to pre-injury activities.